Something had to give when two titans of the Premiership battled it out last weekend. Lovat travelled to Newtonmore looking to stay top of the table, with both sides undefeated going into the game. Their Premiership history couldn't be more different, though. 'More are aiming to land their fourth title in a row this season, while Lovat are hoping to take the Premiership crown for the first time ever. Those stats, however, counted for nothing on the day as Lovat ran out 2-0 winners courtesy of two second-half Kevin Bartlett goals. Newtonmore did play well, and hit every bit of wood around the goals, but not the net between it. Lovat have played a game more in the league but the result was massive for a club who, until last year's MacTavish Cup success, had not picked up any silverware since their historic Grand Slam year of 1953. I have said numerous times in this blog over the past couple of years that Lovat have the potential to enjoy the same success that Kingussie had in the 1990s and early 2000s, when they secured Grand Slam after Grand Slam. It won't necessarily happen this season or next but, for me, Lovat are the team to watch over the coming years. They have a great core of young players with a real opportunity to progress. But with only one game to go until the halfway point in the season, can they lift the league title? What do you think? Sitting top of the table brings its own pressure, so can Lovat's young players cope with leading the Premiership pack? 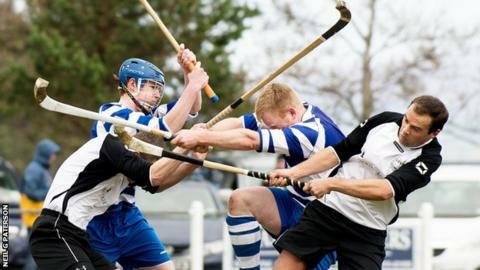 Last week I asked you for your top shinty 'Gurning' pictures and thanks for all the brilliant snaps. My favourite goes to Neil G Patterson's fantastic image of Kyles Athletics' Tom Whyte chasing the ball during last years Camanachd Cup final. Keep the 'Gurning' pictures coming and I will select my favourite each month, and then the best of the season. Safe travels to all clubs and supporters this weekend.